Then, click the issue number you want, and you'll see it listed on its page. The top of page gives information about the series. Tips 1-4 help you find other, related series. 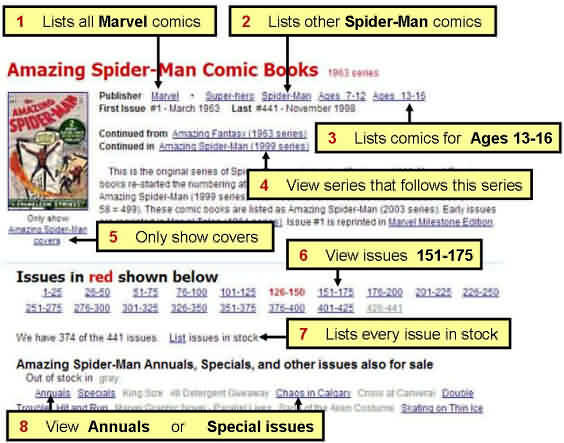 Tips 6-8 help you find specific issues of this series. The bottom of the page gives information about each issue. Tip 9 lets you customize the page. Tips 10-13 provide more information about each available copy. 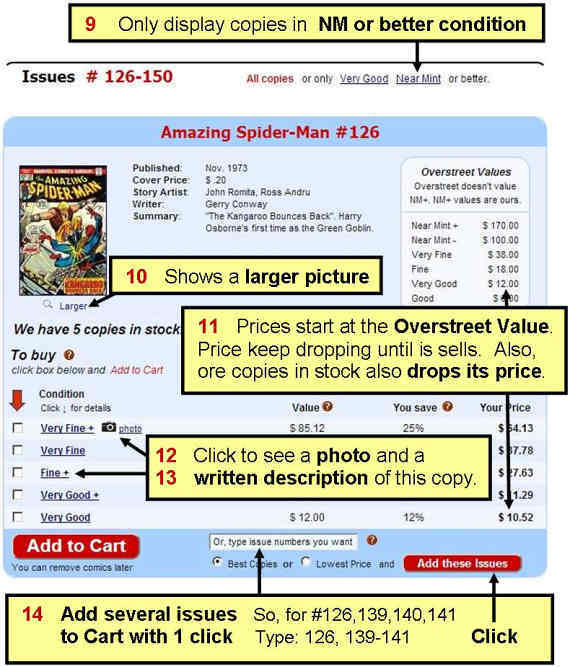 Tip 14 lets you add several issues to your Cart with 1 click. Step 1: I went to three different comic book sellers and for each, I picked out books, that had a total marked price of $1,300 to $1,350. Issues included Iron Man #1, Silver Surfer #1, Daredevil #1, Wolverine #1, G.I. Joe #1. Step 2: I offered each, $1,000 (75% of their marked price). None would sell at that price. Instead, the average price I paid for each group was $1,124. Total spent: $3,372 (85% of their marked price). Step 3: I brought them back to NewKadia and our professional graders graded each one and assigned their Overstreet Value as our listing price: $2,950. 1. NewKadia's prices are 13% lower than ComicCon prices. 3. Our asking price ($2,950- the price we list each comic for) is 26% lower than their asking prices ($3,990). 5. If you buy comic books at a comic book show, and the seller drops his price 25% from the marked price, you may think you're getting a great deal. You're not. 6. Attending the Comic Con was fun. Seeing all the people dressed up, looking at the artwork of aspiring artists, talking to other fans, etc. But buying there? Doesn't make sense. I go to smaller local shows and ship at the dealers that are there to unload the overstock. This one dealer sells books ten for a dollar and the admission is the bucks. I've also meet some classic guys as well as some new up and comers at these sites. Generally speaking you rarely get deals for any key issues at the major cons in any city. Prices are always overinflated I think. If you are actually holding the book in your hand, you'll be willing to pay more in order to take it home right there and then. There are still cons where you can get things at fair prices. However, these cons aren't the major ones. 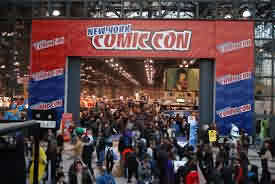 They are the smaller shows run by people and not corporations like NYCC and SDCC and Wizard World. i always go to bigger shows when I am looking to sell books that I just want cash for and don't want to put on eBay. They always pay more since they sell for more. I hardly ever buy at big shows. I've found at every convention I've been to (admittedly only three), that the comics are valued way higher than they ought to be. One "dealer" (using the term loosely) was selling an absolutely battered Batman #1 from the New 52, at $40, cover had large visible rips in it as well. Whenever I go to a con big or small I take a list of what I want and how much I found it at various online sites. If its a solid book at a decent price im getting it. I have bought books off of newkadia among other sites as well. Love the convenience that the online sites give but nothing to me beats going through a box of comics and finding a buried treasure or two. What im getting to is go with a plan and dont go higher than your comfortable with on price. While I am not paying out that kind of money I have found this to be very true. If you check for the same issue at multiple tables it will be a different price at each one and Sunday is even worse when the sellers want to get rid of their stuff at all costs. Yeah comic cons will kill you with prices. I found ONE booth that had pretty darn good prices and that's it.